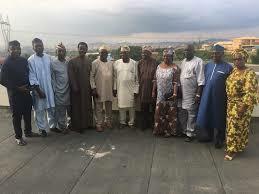 Leaders of the Yoruba socio-political group Afenifere yesterday visited former President Olusegun Obasanjo in Abeokuta. The visit was part of its consultations ahead of the 2019. Giving a hint on the candidate it will support, spokesman of the group Yinka Odumakin said after the meeting with Obasanjo: “The 2019 election is going to be interesting but what is paramount to the Yoruba race is restructuring and clearly, you should know that Afenifere will always support a candidate that is ready to restructure the country because without restructuring we are going nowhere. The group said some months ago Obasanjo visited one of its leaders Chief Ayo Adebanjo and we discussed some issues and today we are here to as well to visit him (Obasanjo) and appreciate his visit to Lagos the other time. 'We are trying to further the friendship so that there can be harmony in Yoruba land so that our people can know that leaders across divides are coming together to discuss the way forward,” Odumakin added. The meeting which started around 3.30pm lasted about two hours. Odumakin added: “The meeting also aims at creating a harmonious position in Yorubaland over the leadership of the country in respect of the 2019 elections. "The elections are around the corner and leaders across Nigeria are coming together to discuss the event, which is so crucial to the life of the nation. "All hands must be on deck to get the country re-established and all grey areas must be ironed out. "The pendulum is swinging and we will let you know where it finally settles."